It all started when our friend Joel let me know there were frogs in them thar hills. Bullfrogs? Yep. Bigguns? Yep. We’re so there. “We” happens to be my girlfriend Holly and me; Holly’s been super busy lately, so it was great for her to finally get to join me on an adventure. We headed up the hill on a recent Friday evening for what felt like a proper date — if you like your girls dirty, muddy and grinning while holding a stuck frog on the end of her spear. I know I sure do. Prepped with a few beers, we headed out for the Secret Spot, which, suffice to say, is somewhere around the lake on the California side between Truckee and South Lake Tahoe. Honestly I am not certain exactly where we were. It was dark, and did I mention I might have had a few beers? Joel had a Hawaiian sling normally used for spearfishing, a powerful spotlight and a 5-gallon bucket with a lid. All three are vital frog killing tools. Yes, I know: The Cajuns just grab their frogs. I prefer to kill at a gentlemanly distance. Actually, the real reason is because I’m just too slow to catch them by hand. The spotlight is important because even my mag light/truncheon wasn’t powerful enough to really spotlight the wily amphibians. And the bucket should be obvious, as should the lid. What? Aren’t the frogs dead when you spear them? Um, sorta. Please refer to my post on how to clean a frog for the grisly details on this one. So out into the night we went. I looked exactly like someone from Swamp People, with rubber knee boots, jeans, ball cap and a t-shirt. Holly had her boots, too, while Joel went surfer: sandals and shorts. We were all armed with spears; Holly and I sported quadridents — Poseidon’s trident isn’t good enough for frogs, which, as you know, can partially live on land. A party of beachgoers asked us what we were doing. “Frog giggin,'” I said, being sure to clip my gerunds. For some reason vaguely having to due with the South (the native home of the American bullfrog), it just seems more natural to say “giggin'” as opposed to “gigging.” Imagine John Kerry hunting frogs and you’ll have an idea why. The beachgoers muttered a nervous “good luck” and began to pack up for the night, one eye on us. We didn’t care. We were all ears, listening for it. As night fell, the ponds we were hunting grew silent. Where were they? Joel began to fidget a little. He’d promised us a bonanza, after all. Thrummmm, THRUMMMM! There it was! Joel aimed his spotlight beam at the sound and we all saw it at once: The unmistakable smiley face of a spotlighted bullfrog. The eyes and what pass for a frog’s lips refract light, making them look like little smileys right above the water. It’s a touch macabre. They sit, mesmerized by the light, while someone creeps up close with a spear. So long as you never cross the beam of light the bullfrog will sit still. Closer, closer you creep, until your spear hovers right over the frog. You tense yourself as you lower it closer to his back. From here on in, it’s your reflexes against his. With a lightning jab you either have a bullfrog stuck with a four-pointed spear, or you have a frog calmly gliding under the water out into the night. I’d be lying if I said I never missed, but none of us missed much. Spearing the frog is one thing. Once you’ve pinned him to the bottom, you then need to grab his legs and wrench him off the spear and toss him into the bucket. Here’s where the lid comes in. Frogs jump. It was a little disconcerting to hear a bunch of gigantic bullfrogs (some weighed more than a pound!) jumping around in the bucket as we speared one after the other. But damn was it fun! There’s something primal and childlike about gigging frogs. You’re out after dark, getting wet and muddy and spearing slimy things that you plan on eating — you know they’re tasty, but if not you can use them to scare off little girls. When it was over, we’d speared 14 big bullfrogs in about 90 minutes. Not a bad haul. We toasted to our success with another round of beers. I can hear some of you wondering whether it’s a good idea to gig frogs when, after all, there are endangered red-legged and yellow-legged frogs in the Sierra Nevada. I can assure you that when you get within eight inches of a bullfrog, you know damn well it’s a bullfrog. What’s more, bullfrogs eat these endangered frogs. They are invaders from the South. Apparently, some chucklehead brought bullfrogs to Contra Costa County, in California’s Bay Area back in 1896. The plan was to ranch them as a sort of amphibious fish farm. Frog legs sold for the equivalent of $7.55 per pound back then, which, oddly, is about the same price you can get them for now. Well, bullfrogs made it to Lake Tahoe by the 1940s, and although they missed the Gold Rush by a century, they’ve been pretty happy there ever since. And almost since their arrival, state and federal authorities have been trying to get rid of them; the last effort cost the taxpayers more than $200,000. Yet there are still lots and lots of bullfrogs around the lake. Tell you what, State of California: I’ll keep gigging frogs if you pay for my gas up to Tahoe. Deal? 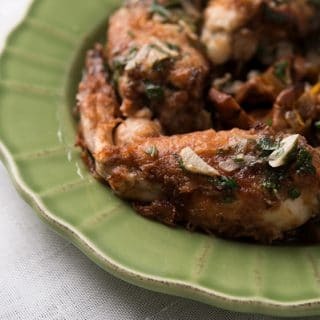 This is a classic Provencal recipe called cuisses de grenouille à la Provençale, and it is the way I first ate frog legs, back when I was a boy. I can vividly remember it. Frog legs were part of the gourmet buffet at a place in West Orange, New Jersey called The Manor. I also remember that mom used to starve us all before we descended on the buffet like Visigoths. I am pretty sure I ate close to 10 frogs’ worth of legs at one trip to the trough alone. For the record, frog legs really do kinda-sorta taste like chicken. Light, flaky, mild, they are like a combination between chicken breast, shrimp and crab. Damn good. Make more than you think you need. This recipe works best with a combination of clarified butter, which you can buy in large supermarkets as Indian ghee, as well as regular unsalted butter. Or, you can clarify butter yourself; my colleague David Lebovitz has a tutorial here. 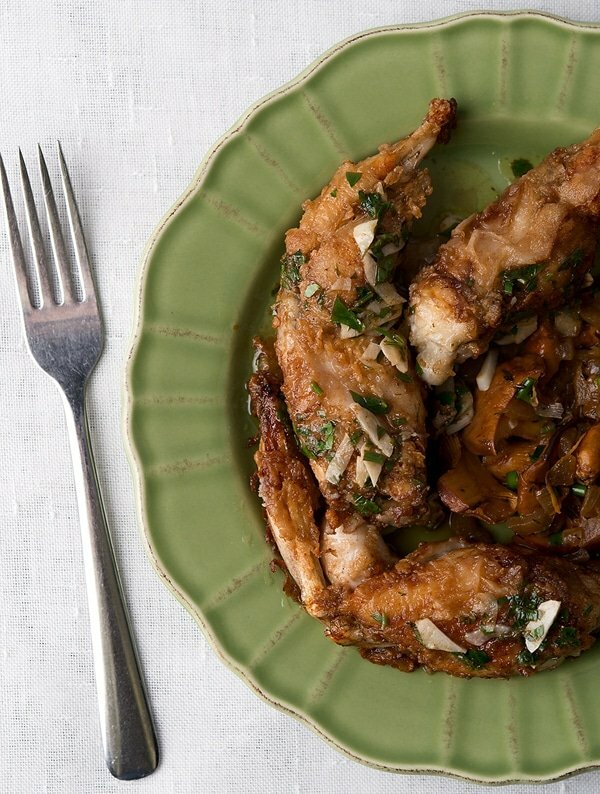 You use the clarified butter to cook the frog legs and the regular butter for the sauce. Why bother? Clarified butter has a higher smoke point and holds up better when frying the frogs, while the regular butter tastes creamier for the sauce. You can of course use regular butter for everything, but it will scorch a bit. Heat 5 tablespoons of the butter in a frying pan large enough to hold all the frog legs; if you don't have a pan large enough, put a baking sheet in the oven and set a rack inside. Turn the oven to about 180°F. You'll use this to store the finished frog legs while you fry the rest. If you do have a large enough pan, set the baking sheet with the rack set inside next to the stovetop. 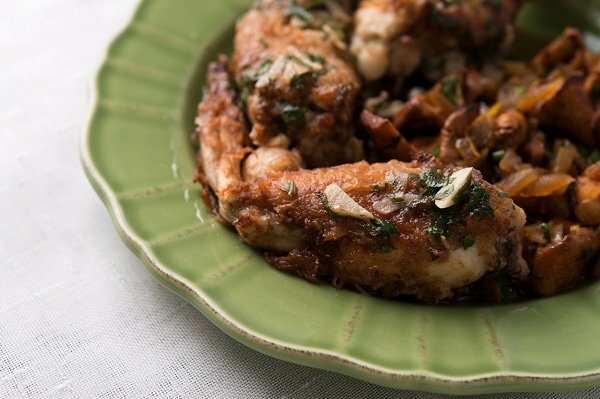 I served my frog legs with sauteed chanterelles and crusty bread. But boiled or roasted fingerling potatoes would be another good option, green beans an ideal veggie, or maybe a bitter greens salad with a vinaigrette dressing. White wine or a lighter beer, i.e., a lager or pilsner, is a must. 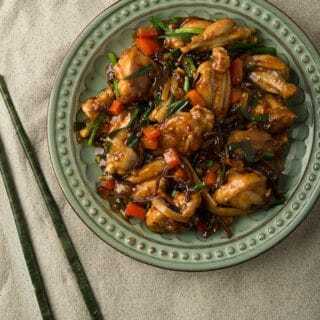 Try another one of my favorite recipes for frog legs, right here on Hunter Angler Gardener Cook!